I have over-animated insides. I’m hyper and impatient. Just writing this line, I’m thinking, “Why aren’t I at the end of the sequel to this book?” I like writing, but it doesn’t happen fast enough for my measurement scale of what’s tolerable. I learned to meditate a ways back as a way to try and relax. I do it regularly twice a day. It hasn’t slowed down the inner revving though. It has given me an acceptance of my naturally accelerated ways. Time travel is perfect for me because it allows instant getting to the place and time I want to be. Of course there is the packing of snacks (some time and space destinations have abysmal food choices), then the walking to the machine, and finally typing in the destination, and sometimes all that seems to take forever (about ten minutes at the most), but I grin and bear it. Today I took a time travel trip to just outside Caldwell, Idaho, June 10th, 1903. I waited alongside a dusty and dirty barely a road. The waiting wasn’t difficult because I brought a ping pong paddle and ball and began hitting the ball repeatedly up in the air. Sure it’s repetitious if you have to watch me do it, but doing it is illustrious for my mind. Suddenly on the Idaho dirt road I smelled the distinct odor of gas and oil. Then I heard the approach of a loud put-put-puttering from an old-timey automobile. And then there it was, the Winton Motor Carriage, with two human passengers and a dog, coming my way. They stopped, got out the car, and introduced themselves. 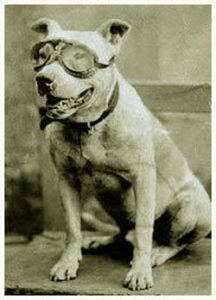 It was Horatio Nelson Jackson, Sewall Crocker, and their dog, Bud, all wearing goggles. They were in the midst of attempting the first car cross-country drive. I bent down and pet Bud’s head. It was a nice thick head. That morning I’d seen a Ken Burns documentary about their famous drive, and was enamored of Bud from old silent film newsreel footage that was shown. That was the reason I took this trip. 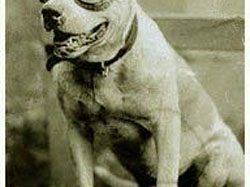 I once time-traveled to 1786, Mount Vernon, Virginia just to meet George Washington’s dog, Madame Moose.